The main purpose of signs and banners in Minecraft is for the players to leave messages for each other in a multiplayer game, including the rules for an adventure map. Banners and signs can also be utilized as ornamental pieces used to decorate your house, declare your allegiance to a guild (or group of friendly Minecraft players), or warn players about dangerous areas. These are great items to help communicate with other players without directly chatting with them in-game. A sign is a nonsolid block and, just like a door, can therefore stop the flow of liquids. You can also use a sign as a decorative item, such as a headboard with your name inscribed. 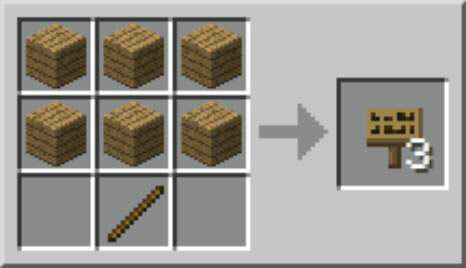 To build a Minecraft sign, place 6 wood planks on the top 2 rows of the crafting table. Then place a stick in the bottom middle slot. Using this recipe will build you 3 individual signs that can be separately placed and edited. Now that you have learned how to craft a sign in Minecraft, you can now place and edit the message of any crafted signs throughout your virtual world. As a player, you are able to place a sign in the ground, on a wall, or block. When placed underwater, a sign creates an air bubble, allowing you to breathe while accessing the sign. Additionally, mobs can walk through signs, though they usually see them as solid and try to walk over them. When you place them on the edge of a cliff, mobs often try to walk over them and fall off instead. In addition to placing a sign in the game, you are also able to edit the message seen on it. Each sign holds 4 lines of text with as many as 15 characters per line. You cannot edit the text after a sign is complete. Neither does the copy-and-paste action work on signs. Parents can take comfort! Minecraft doesn’t allow inappropriate language — it checks before allowing a sign to be posted, though this method is not perfect (and only applies to multiplayer mode). For example, the words hoe, monster, and shaft aren’t allowed, even though they apply to the game. You can change the color of text by using a map editor like MCEdit. Map editors allow players to alter portions of the game, like terrain or even inventory. To change the text of a sign, you must break the existing one and post a new one. Note: When you break a sign, a sword is effective but takes double damage. Banners work much like signs and hold a flag. They can be placed on the wall or on the ground facing different directions. A basic banner is crafted using wool and a stick taking on the color of the wool (16 different dye possibilities in Minecraft). Learn how to make a banner in Minecraft by following these steps. To make a standard banner, place 6 wool in the top two horizontal rows of the crafting table. Then place a stick in the bottom middle slot.